Read an excerpt from WHAT WE SAW for free in the Publisher's Marketplace 2015 Fall/Winter YA Buzz Books Collection. This story—inspired by real events—from debut novelist Aaron Hartzler takes an unflinching look at silence as a form of complicity. It’s a book about the high stakes of speaking up, and the razor thin line between guilt and innocence that so often gets blurred, one hundred and forty characters at a time. What We Saw is the sort of haunting mystery I enjoy, a suspense where you never quite know what has happened or in which direction the book will go. It is also inspired by real life events which is all the more tragic because it is something that happens seemingly all too often. It all started at a party held by a popular athlete named John Doone; our narrator is Kate Weston who attended but left at an early hour without knowing the details of what went on until people started to gossip and images emerged on social media the next day of a girl named Stacey passed out on another athletes shoulder – she didn’t seem alert but because of her reputation things were overlooked by the party-goers but then charges were pressed against four boys at the party and things became quite serious for everyone involved. Kate’s reaction to these events were realistically portrayed, anger – confusion – denial. Her best friend now boyfriend is Ben Cody, a character I quite liked but also someone who I was never quite sure whether could be trusted or not, I found Ben and Kate’s relationship to be interesting and I wasn’t completely sold on the outcome of it all. The setting is a small town and the repercussions of this event weren’t as I would expect, the guys involved were considered heroes because of their sporting status and the girl slutty because of the way she was dressed and her social standing; this is a book that should be in libraries, the message is powerful and the main character strong in her thoughts and convictions, I admired her for her courage. What We Saw is an intriguing book about small town politics, choices, consequences and the aftermath of a traumatic event, it is wonderfully written and a great debut for author Aaron Hartzler. About the author: Aaron Hartzler is the author of Rapture Practice (Little, Brown), a memoir about getting kicked out of his Christian high school two weeks before graduation. The New York Times called Rapture Practice "effervescent and moving, evocative and tender." It was also named one of Kirkus Reviews and Amazon's Best Books of 2013, and was a finalist for the Lambda Literary Award. 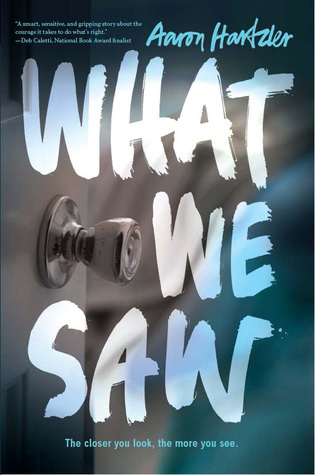 His next book, a novel called What We Saw, will be published by HarperTeen on September 22, 2015. It's the story of a girl named Kate whose friend is assaulted by student athletes at a party, and how Kate navigates small town politics to find out what really happened. Aaron lives by the beach in Santa Monica with his two dogs, Charlie and Brahms. You can find him on Twitter and Facebook. Thanks Lisa! 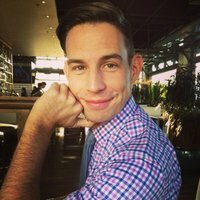 I'd love to hear what you think if you do get a chance to read it. You know I have seen this book around but haven't read the blurb or a review yet. It sounds really interesting and worth picking up - Great review!! I love these types of books, you never quite know what is going on. Now this sounds right up my alley Sharon! I love suspense and mysteries. The cover is appealing too. This was a good one Kimba! I do enjoy a good mystery/suspense.